This house on Moore Lane in Haddonfield was once a 1960’s California Contemporary style house with steep pitched roofs, barn siding and few windows. Our job was to re-make this into a more traditional french classic style. We transformed this home by gutting the interior, re-facing the exterior with stucco to compliment the stone chimneys, and adding dormers and grand manor roofing shingles to add drama to the overall appearance and quality to the house. Upon entering the site, you pass through an arcade along the beautiful french doors to the living room. 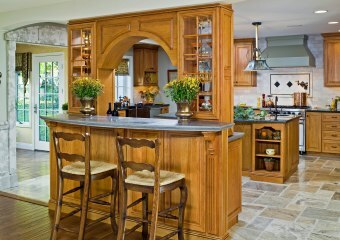 The interior of the house was opened up to create a large volume of space separated by furniture groupings, the family room open to the kitchen island, a country dining room and sun filled sunroom. The room that remained intact was the Living Room with its vaulted ceilings, exposed stone chimney. We added the dormers and french doors to add interest to the room. A re-vamped staircase with wrought iron rail takes you to the second floor to the four bedrooms and three baths. 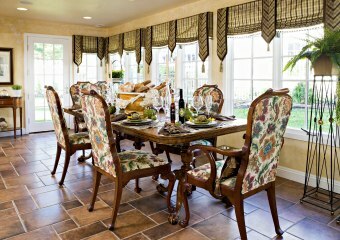 The Master Suite includes a sunny deck overlooking the yard and a french balcony overlooking the pool. A third floor space is used as an art room is finished and includes a full bath. The entire house was used as a show house for a fund raiser for the Mental Health Society and decorated beautifully by a variety of designers. The pool was reconditioned and landscape replaced. 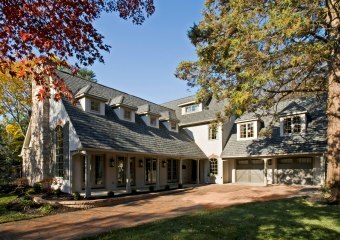 The construction was completed by Wolfson Custom Homes of Haddonfield.